Beautiful decks and seating areas from which you can drink in the stunning views! 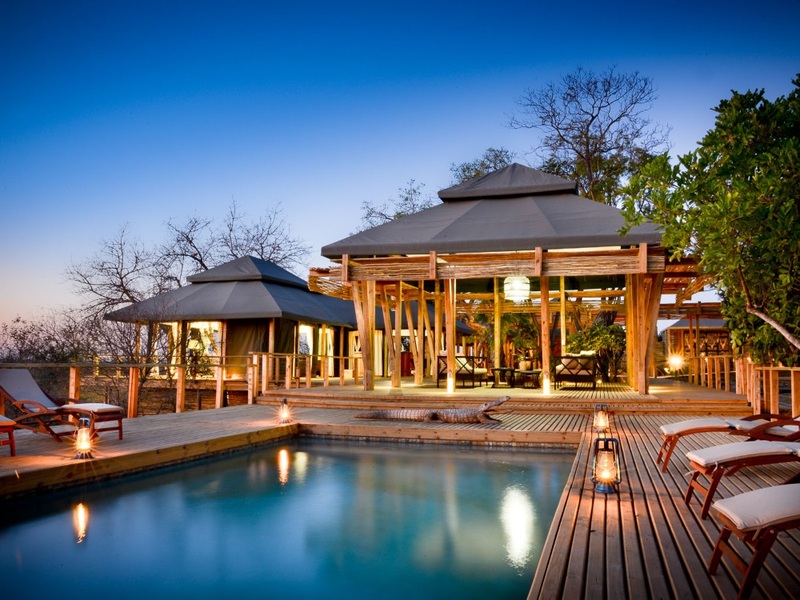 As you can see from our profile, we’re big fans of that old favourite in the Timbavati – the no frills, no fuss and ever so friendly Simbavati River Lodge. 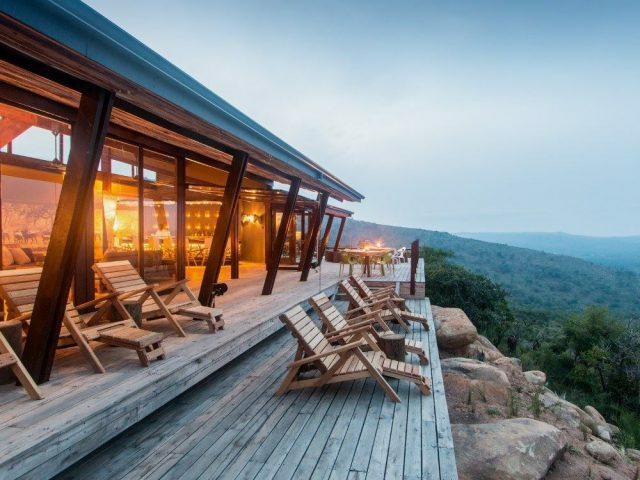 You can imagine how excited we were then to hear of the launch of its altogether more stylish and luxurious big sister – the new Simbavati Hilltop Lodge. If the new arrival successfully manages to combine the warmth and unpretentious hospitality of the original with an altogether more upmarket accommodation experience, it looks like being a real winner! The “Hilltop” part of the lodge’s name refers to the fact that the main public area of the lodge – the main viewing deck, bar and restaurant and stunning infinity swimming pool – are positioned on top of a small koppie, enjoying stunning views over the Nhlaralumi River below with the bush vsitas stretching to the distant Drakensberg mountain range. 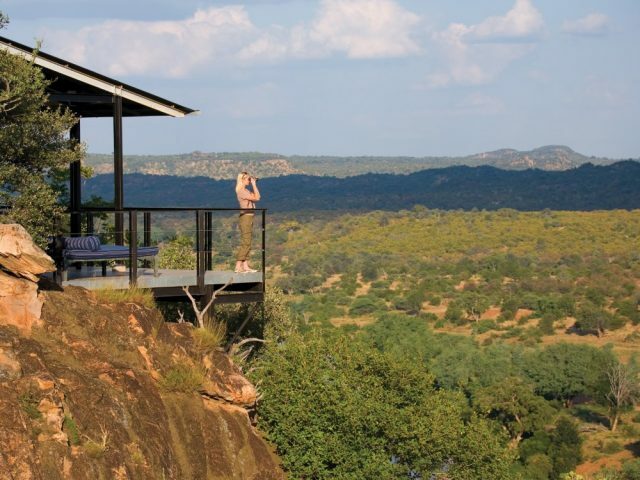 The lodge’s 8 suites are actually scattered on the slopes below – in fact they’re perched just above the river bed. Each suite comprises two individual tents: one for the main bedroom and a separate bathroom, which is linked by a passage that can be opened up on one side – this allows for an indoor or private outdoor shower experience. Privacy is guaranteed thanks to the careful placement of the tented-suites, ensuring a tranquil and intimate stay. 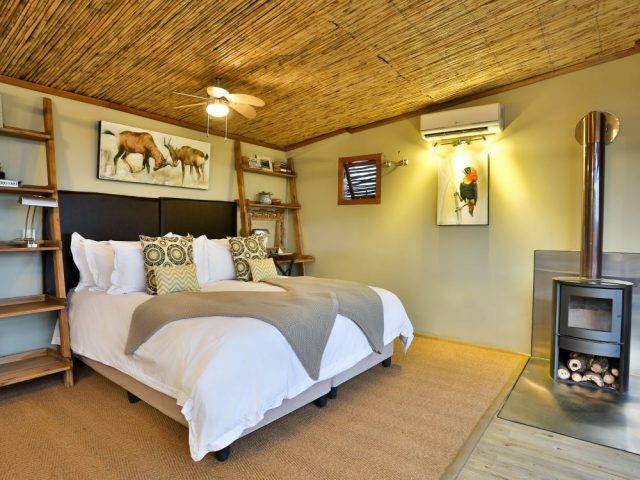 The lodge’s architectural style definitely makes it one of the new wave of game lodges that has tossed aside the old fashioned thatched stereotype – in its place Simbavati Hilltop boasts a bold mix of attractive structural wooden features, packed stone feature walls and a uniquely modern take on traditional tented structures. The result is a very attractive and bang-up-to-date contemporary styling success that blends clean and minimalistic lines with the use of organic materials that make it all immediately feel right at home in the African bush (whilst at the same time almost hinting at a subtle Bali-style design influence in the rooflines in particular!) However you choose to describe the new lodge though, we like…very much! The lodge’s lounge areas also attractively hit the spot in combining modern lines with furniture and décor that are comfy and welcoming. A favourite has to be the lounge and bar area adjacent to the pool deck, where you can relax and chill with something long and cold in your glass whilst admiring the great 360 degree views! If you fancy doing a bit of sun-worshipping between game drives, then find yourself a lounger alongside the stunning infinity swimming pool. Ultimately you are there to enjoy the bush and game viewing and the good news is that this part of the Timbavati enjoys a well-earned reputation for delivering quality sightings – in fact this is one of our best recommendations for seeing leopard outside of the Sabi Sands. And of course you get to experience it by way of Simbavati’s consistently excellent teams of rangers and trackers. 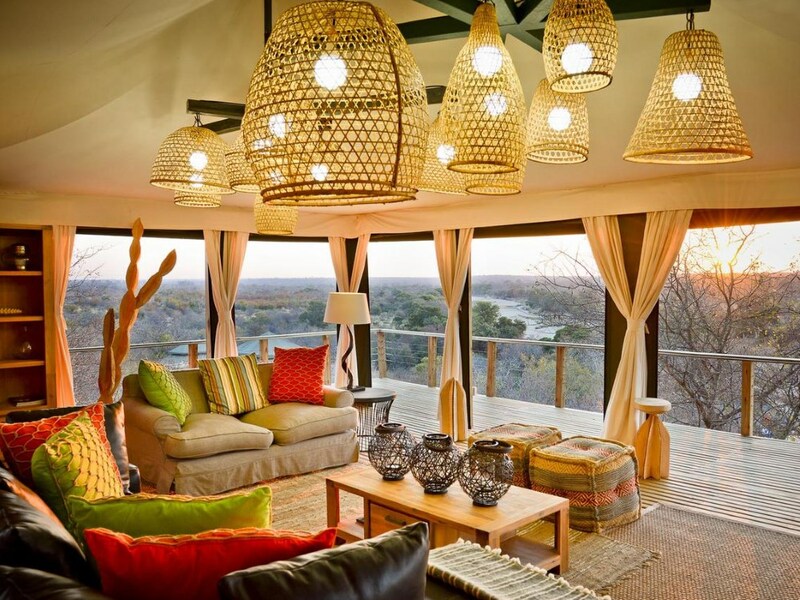 Simbavati’s new Hilltop Lodge is a really stylish and very welcome addition to the lodges in the greater Kruger – our advice is get there before the secret gets out!